Like most families, we are always looking for more ways to cut costs. With extended family all over Canada - and my husband's family wintering in Florida - long distance charges can really add up for us! So when I was contacted today and asked to do a product review of the new netTALK Duo Wi-FI telephone system - it sounded like a great idea! The netTALK DUO is a digital phone device that lets you make crystal clear calls over the Internet. With all the features of your regular phone, without sacrificing quality or reliability. All you need is high-speed Internet and your home phone. Rob (my husband) - ever conscious of money being spent - suggested we should first look up what it is going to cost to use this system. Well, we were pleasantly surprised! When you buy the netTalk Duo Wi-FI system, the first year is completely free. After that the plans start as low as $2.50 a month - or a flat rate of just $29.95 for the year. We pay more than that for just ONE MONTH with Bell! So we are excited to receive this for a product review! I will get back to you as soon as we have had a chance to test it. Rob has offered to make a lot of long-distance calls this weekend to try it out! Hello family! In the meantime, I wanted to let you know that Walmart Canada is having a Back to School sale - if you want to snap one of these babies up! They are on sale for an incredible low price - if I wasn't getting one to try out - I would be tempted to buy one myself! If you do grab one, or already have one - let us know what you think of it! Visit your local Walmart Canada location and look for the "Back to School" display to get your bundle today. It's going to be the perfect affordable product for all your summer travel, a perfect gift for vacationers (or snowbirds! ), or for students going away on campus or abroad! Fire your phone company and start saving money and stop paying monthly bills again forever! Buy one or more to send to loved ones or colleagues anywhere in the world for free unlimited International DUO to DUO calling. 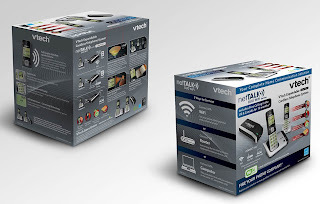 Get Your netTALK DUO or netALK and VTech bundle at Select Walmart CA Locations today and start saving hundreds each year with no contracts or monthly bills. You can select a free new phone number, or even keep your own! With the netTALK DUO, you can stay in touch with friends and family anywhere in the world. Calls to the US and Canada and DUO-to-DUO calls are always free. netTALK also offers Enhanced Call Plans, so calling overseas has never been more affordable. Whether you subscribe to the Basic Call Plan or an Enhanced Call Plan, you can expect to save big with netTALK's versatile and portable phone service. The netTALK DUO is a versatile digital phone device that allows users to make crystal clear calls over the Internet and has all of the features of a phone company, without sacrificing call quality and reliability, all you need is high-speed Internet and a home phone handset. Now you can get both at an incredibly low price, including one free year of service. 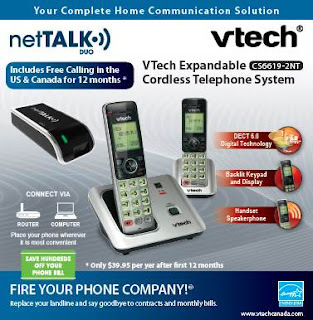 The netTALK and VTech bundle combines a netTALK DUO and a VTech Expandable Cordless Telephone System (CS6619-2NT) two handset home phone system in one box. Includes 12 months of free calling throughout Canada and the U.S. with free calling features such as call waiting, call forwarding, conference calling, enhanced 911, 411 directory assistance, visual voicemail, call blocking, 3-way calling plus many more. 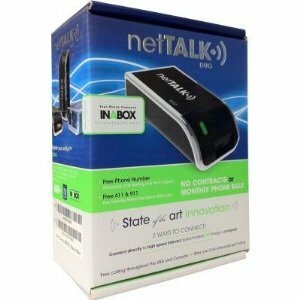 The NetTalk DUO Wi-Fi is a sleek and small VoIP telephone device that connects directly to your router, computer, or wirelessly over Wi-Fi, creating a fax-friendly phone line with free calling features such as call waiting, conference calling, Enhanced 911, 411 directory assistance, visual voicemail (voicemail sent to your e-mail), and a videophone application. Integrated Wi-Fi wireless networking card connects to your home network, cutting to cord from your computer or router and allowing you to place it anywhere. Make free local and long distance calls in the US and Canada, ultra-low cost international call plans, and free DUO-to-DUO calls to anywhere in the world. No contracts, no monthly bill, and live US-based tech support 7 days a week. Includes 12 months of the NetTalk service.